Chrichton's World: Review Iceman a.k.a. Bing feng: Chong sheng zhi men (2014): Insanely bad with emphasis on insane! Review Iceman a.k.a. Bing feng: Chong sheng zhi men (2014): Insanely bad with emphasis on insane! Iceman is a remake of a movie called Iceman Cometh (1989) starring Yuen Baio. That was a charming little martial arts comedy but nothing too spectacular. But an upgrade starring Donnie Yen can't be that bad can it? 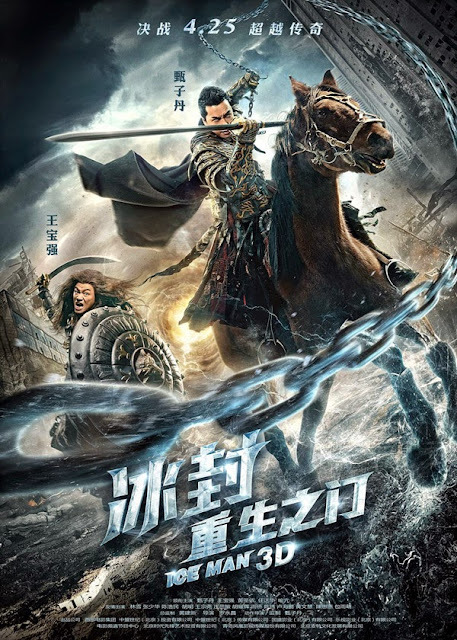 Donnie Yen is an amazing martial artist but he sure makes really bad choices when it comes to the movies he stars in. Iceman ladies and gentlemen is completely ridiculous. Every time when this film appears to go a little serious it screws it up with it's random lunacy. There is this one scene where Donnie Yen' character uses a toilet as weapon. It's utterly disgusting and it really boggles the mind why that scene was put in there. I like to laugh from time to time but that to me is not funny. Not saying that some of the slapstick comedy is not working. Because sometimes it does but at one point it does make you wonder if there is an actual plot. Only very late in the film there is some reveal that makes things interesting and guess what then it ends. Iceman ends on a cliffhanger. It already felt like it took forever for this film to end. To then realize that the film is not over yet and that we have to wait for the sequel to see how events will play out is incredibly infuriating. When I went along with the craziness of this film I could enjoy it much better and even was treated to some nice martial arts scenes. However everything in this flick is so random and illogical. There is no coherency to the story at all. Thanks to Donnie Yen and Simon Yam Iceman remains a little interesting but you have been warned it's a real chore to sit through this film. It does look like that things really start to get compelling in the sequel. But it's hard to tell really what direction it's heading. If you want to watch this for the action then you will be very disappointed. There are only a few scenes and I don't think they are that special to warrant a viewing. If you like weird and bizarre films then this will be right up your alley. Otherwise stay clear!